Despite its somewhat dated façade, the Tennis Stars slot from Playtech is a worthy title to take a few spins on. It has some great features which really bring the game to life, and the interactive “Championship Bonus” is both an entertaining and potentially lucrative addition. The slot itself has five reels and four rows, with an impressive 40 different win lines. The machine also offers a sizeable main game jackpot and loads of variables to play around with to mix up betting sizes and distribution across the game board. Great bonus features. Tennis Stars has a total of three different exciting features. From the action of the championship game to the potentially lucrative free spin mode, there’s plenty to engage players even after repeat visits. Players are given full control over where their money goes on Tennis Stars. They can adjust the number of win lines active, the value of each coin, and the number of coins bet per line. Even though it plays great, Tennis Stars is not a looker by 2017 standards. There’s no on-reel animation and the artwork is rather uninspired. The music can drive you insane. It’s a sort of 90’s arcade game style loop that isn’t fresh on first listen, let alone fiftieth. Fortunately, it can be muted easily enough. Either tennis pro = 5,000x the line bet. Tennis shoes or ball = 1,000x the line bet. 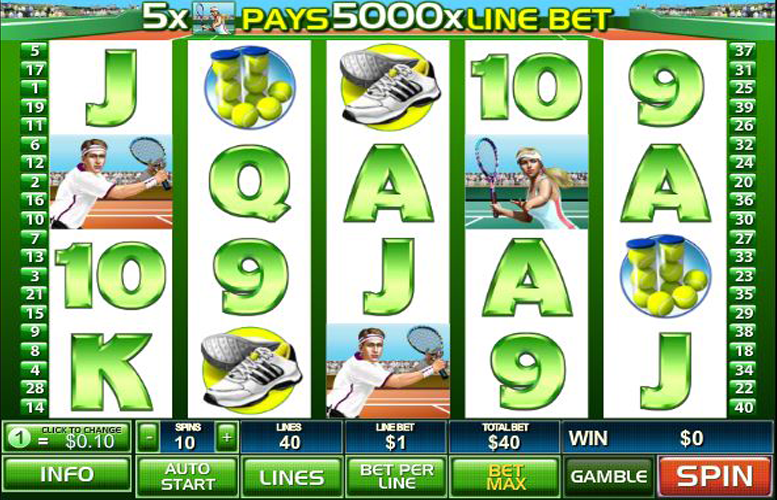 Certainly, one of the best things about the Tennis Stars slot machine is its extensive features. These bonuses not only keep the game fresh, they can also be incredibly lucrative. 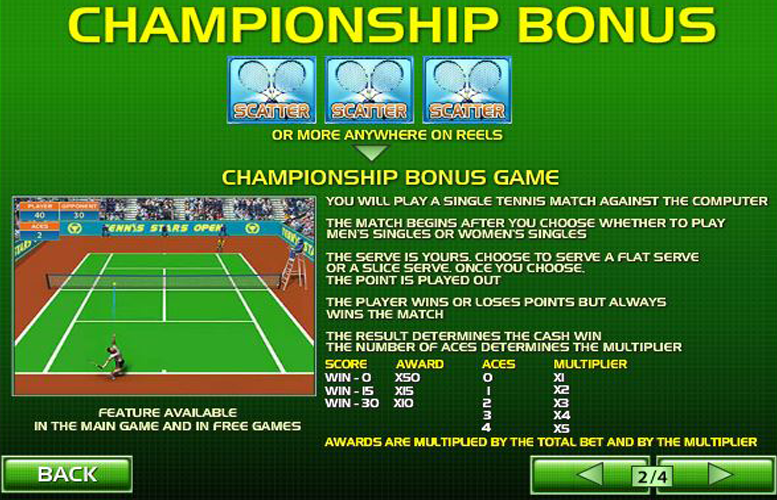 Landing three or more tennis racquet “scatter” symbols anywhere on the reels will trigger the Championship Bonus. In this game feature, players must play a match of tennis versus the computer. The match begins after they choose whether to play Men’s Singles, or Women’s Singles. The first serve goes to the player and they’re presented with options for either a flat serve or slice serve. Following their selection, the point is played out. Landing simultaneous trophy “wilds” anywhere on reels two, three, and four simultaneously will award an instant payment of 10x the total bet and fifteen free games with a 3x multiplier. Players should note that during the free games bonus, any winnings that might be awarded during the Championship Bonus are not tripled. Hitting “wild” symbols on reels two, three, and four again during the free spins will award the same bonus again. This dynamic can occur indefinitely. There is no limit to the number of consecutive free spins that can be won. 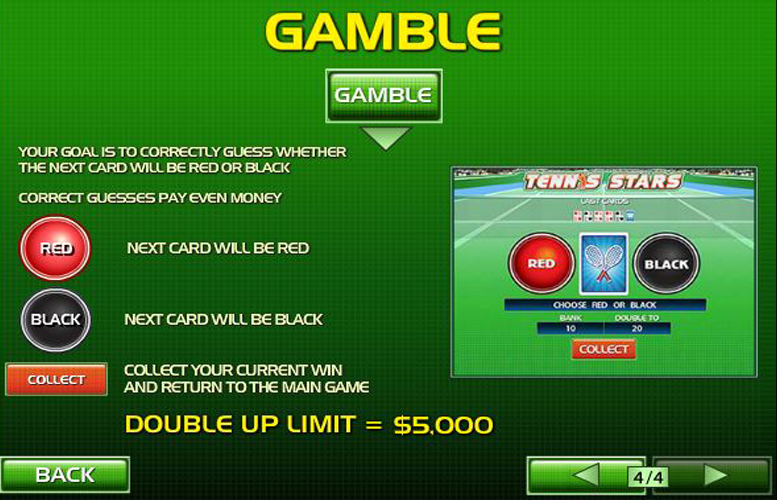 Tennis Stars also features a gamble option. Following any single win, players are given the opportunity to gamble their winnings on a simple “red or black” guessing game. To initiate the mode, they must first win a prize and click gamble. They’ll be taken to another screen and presented with a single face down playing card with an option to guess either red or black. After making their selection, the colour of the card in the centre is revealed. Correct guesses win a full double up of the original prize, whilst incorrect picks forfeit any winnings. The maximum winnings possible from this side game is an impressive £5,000. Ace or King = 400x the line bet. Queen or Jack = 250x the line bet. Players are given total control over their betting sizes and distribution on Tennis Stars. They can adjust the value of each coin (1p-£5), how many are bet per line (1-10), and how many lines to bet them across (1-40). This means that with all values set to the minimum, the lowest possible bet per spin is just 1p. Meanwhile, by setting all values to the maximum, high rollers will be pleased to learn that the maximum possible bet is £2,000 per spin. Tennis Stars from Playtech is a great machine. It’s full of interesting features and they’ve been worked into the theme well. 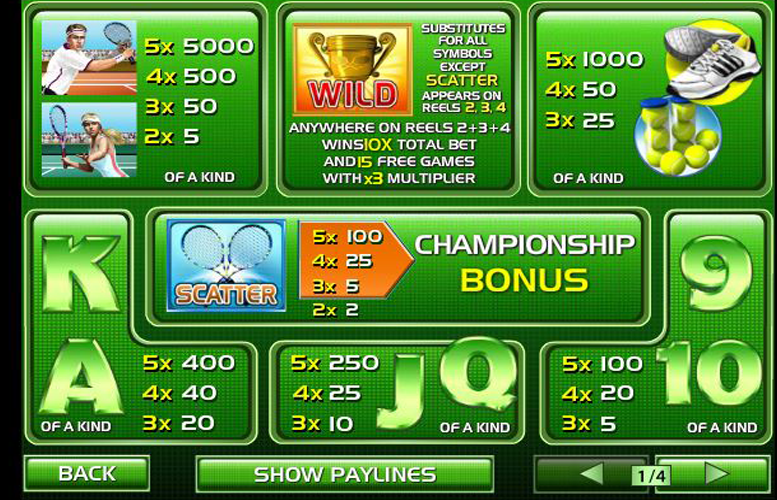 The top jackpot is a decent one and if it were to be combined with one of the bonus multipliers could be enormous. Unfortunately, the game isn’t perfect. Whilst it might have been in 2006, today, the dated graphics and lack of animation make it feel old. Don’t get us wrong, there is still a lot of fun to be had on the game, it just isn’t as visually appealing as some of its modern peers. That said, a 2017 reboot would be cool, if anyone at Playtech is reading this. This game has a rating of 4 / 5 with 592 total reviews by the users.